Suzie Sauce, under jockey Gonzalo Cutierrez, winning the $25,575 AQHA Maiden Challenge at Will Rogers Downs Sunday afternoon. CLAREMORE, OK�NOVEMBER 6, 2016�Suzie Sauce made a big step up in class Saturday when she held off Tres Tacho by a neck to the $25,575 AQHA Maiden Challenge at Will Rogers Downs. Hitta Big Lick finished a nose back in a blanket finish to get third place. Ridden by jockey Gonzalo Cutierrez, Suzie Sauce completed the 350 yards in :17.846 seconds to pocket the winner's check of $12,532. James Goodnight saddled the 3-year-old daughter IVORY JAMES to her first win in four starts for owner/breeder Shelley Coldwell Goodnight. The filly had started for a $15,000 tag at Will Rogers last month. She is out of the Corona Cartel mare Dc Cartel. Also lightly raced, the 4-year-old Tres Tacho earned $5,371 for second. Cristino Estrada, Sr. saddled the gray gelding in only his third career start for owner Francisco Sifuentes. Marshall Weir bred Tres Tacho in Texas. Hitta Big Lick races owners Vicki Tedbow and Matt Ratliff. Stacy Charette-Hill conditions the gelding. 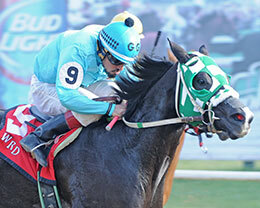 Ridden by jockey Jorge Torres the brown gelding earned $2,685 for his effort. Paint Me A Runaway, A Secret Strawfly, Wind It Up Mightyman and Believn Agrandflight completed the field.